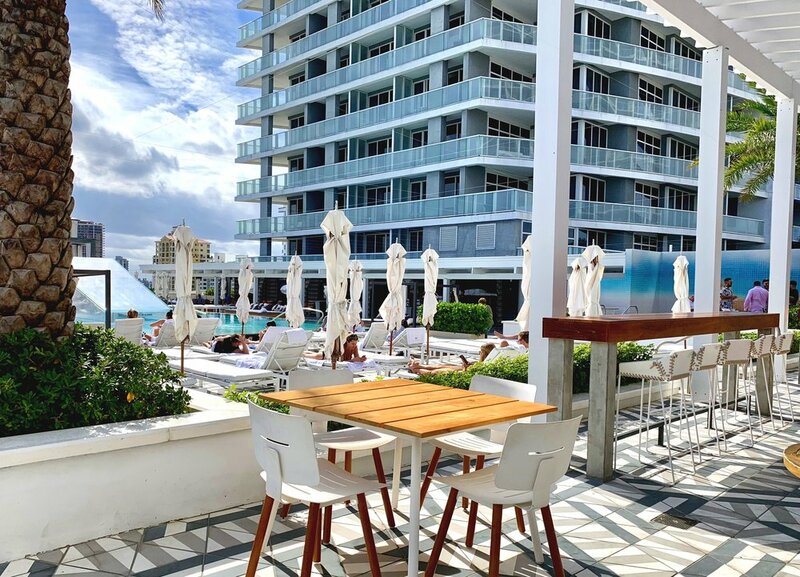 Situated on the beachfront on north Fort Lauderdale Boulevard, just a 10 minute drive from both the airport and Port Everglades the W Hotel, Fort Lauderdale is the perfect place for a pre or post cruise stay if cruising out of Port Everglades. Across the road from the beautiful beachfront with stunning views out to sea (to watch the cruise ships coming and going), surrounded by bars, hotels and restaurants, all within walking distance, and the shopping district a short taxi ride away, this hotel is ideally located for either relaxing or exploring Fort Lauderdale. The location of the W is perfect. We had booked into a ‘Spectacular’ guest room with a balcony and partial sea view for two nights prior to embarking on a Caribbean cruise. The room was spacious and clean with a large balcony. Upon entering the room there was a three-door wardrobe on the right hand side which housed a large, laptop-sized safe, iron and ironing board. Located opposite the wardrobe was a sizeable, open bathroom. There was no door to the bathroom itself but the toilet was separated by a frosted glass door. The bathroom housed a wide vanity unit with plenty of shelving and a decent hairdryer. The mirror above the sink was very well lit and there was an adjustable magnifying mirror. The bath, with an overhead shower, ran along the wall joining the bathroom to the bedroom area which, as seems to be fashionable these days, was divided with a frosted glass screen. We like this feature and enjoy the extra light and open feeling it gives the bathroom, but more importantly we were pleased to see oversized, luxuriously soft bathrobes and towels, a must for making our stay feel extra special. Moving into the bedroom area, there was a large wall mounted flat screen TV at the foot of the bed offering on demand movies (at extra cost), regular TV channels, room account and all the other information one would expect to find in a modern hotel. There was a long shelf under the TV which led into a funky dressing table type arrangement which protruded from the wall out into the seating area and housed lots of tempting in-room snacks, a wine tray, a Nespresso coffee machine and mini bar fridge, stocked with a variety of alcoholic and soft drinks. The seating area featured a large twin circled coffee table and a three seater sofa, though I have to say that, as also seems to be the case these days, the designer has chosen style over substance. The sofa was so hard you really wouldn’t want to spend much time actually sitting on it (though it did look nice!). Three sliding doors at the end of the room lead out onto an extensive balcony with a much comfier sofa, wicker chair and side table, perfect for enjoying a morning coffee on. Unfortunately for us though our balcony was north facing so never got the sun and the weather was rather unseasonable so we weren’t really tempted to sit out there. Although we were in a side facing room it was possible to still appreciate the sea view, but since we were only on the sixth floor much of our view was obstructed by the pool area foliage. Had we been a couple of floors higher it would have been a much nicer, expansive sea view. The bed was comfortable with just the right amount of softness and nice bed linens. Bedside tables housed an alarm clock, a docking sound system, and two of those ever useful usb charging ports. There was lots of adjustable lighting throughout the room with moveable and dimmable reading lights either side of the bed, an ambient lighting strip above the headboard and a funky dimmable light over the bedroom table area. The corridor area outside the bathroom had separate dimmable lighting with useful automatic lights in the wardrobe. The mini bar snacks and treats. Having arrived late and jetlagged we showered, ordered room service and crashed into bed not long after arriving. The room service food was ok and was promptly delivered but we were looking forward to exploring what else this hotel had to offer. Our room was located in the north tower on floor 6 with reception and check-in on floor 4, along with the living room and verandah, looking out over the beach. This is a expansive, light and airy room where guests can relax on the comfortable and varied seating both inside and out, while enjoying coffee, soft drinks, wine or cocktails served from the considerable well stocked bar. To one side of the Living room is the small sushi bar with access to the outside terrace also. The Living room bar and seating area. Leading to the outside terrace. The Living Room bar was a popular evening venue. The expansive Living Room terrace. From The Living room is a staircase for hotel guests who can use their key cards to open the door at the top of the stairs to access floor five which houses the well equipped gym and outdoor pool area with loungers, double day beds, cabanas and spectacular views out to the beautiful beach and sea beyond. Whilst relaxing by the pool there are wait staff on hand to order cold drinks, snacks and light lunches from the wet bar housed at one end of the pool area. As well as offering cold drinks, they also bought round chilled towels and little treats like frozen grapes, a nice touch. We only wish the weather had been a bit better so we could have spent more time round this beautiful pool. The view is wonderful, the service and staff attentive and where better to enjoy amazing sunsets than from this lovely terrace. Down on the ground floor are the hotels two restaurants, both with al fresco seating and lovely ocean views. Steak 954 is the contemporary American steak house serving seafood and steaks which guests can savour whilst admiring the large jellyfish tank set in the wall. this restaurant is open every evening and also for breakfast at the weekend. Unfortunately we didn’t get to eat here, instead choosing the Mexican restaurant located opposite Steak 954, El Vez. El Vez is the main restaurant at the hotel, serving breakfast, lunch and dinner, as well as having a takeaway bar selling snacks and drinks to takeaway. The breakfast menu is extensive and very good, if a little pricey. The evening menu is typical Mexican fayre with a weekday happy hour making it really good value for money. Be warned though, even though the margaritas are two for one they don’t water them down - make your drink last if you want to see the evening out! El Vez snack and takeaway bar. A nod to the beach just over the road. 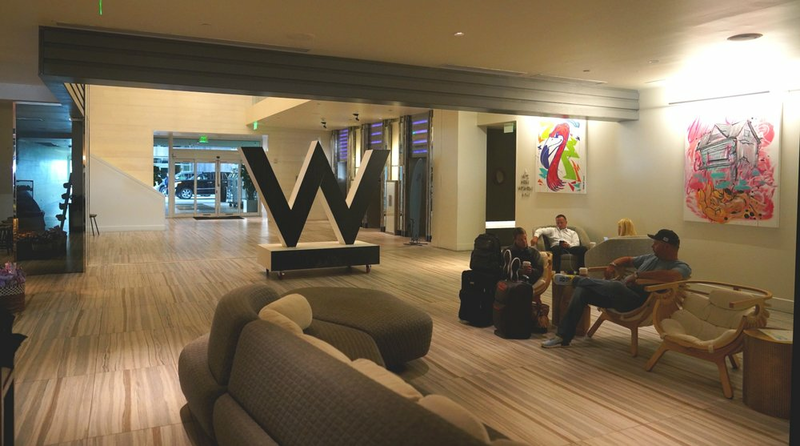 Overall, we loved our stay at the W, Fort Lauderdale. The location is excellent and the hotel has a generally very cool vibe about it. We particularly liked relaxing on the pool terrace, drinking coffee on the Living Room terrace and El Vez restaurant for amazing food and cocktails. 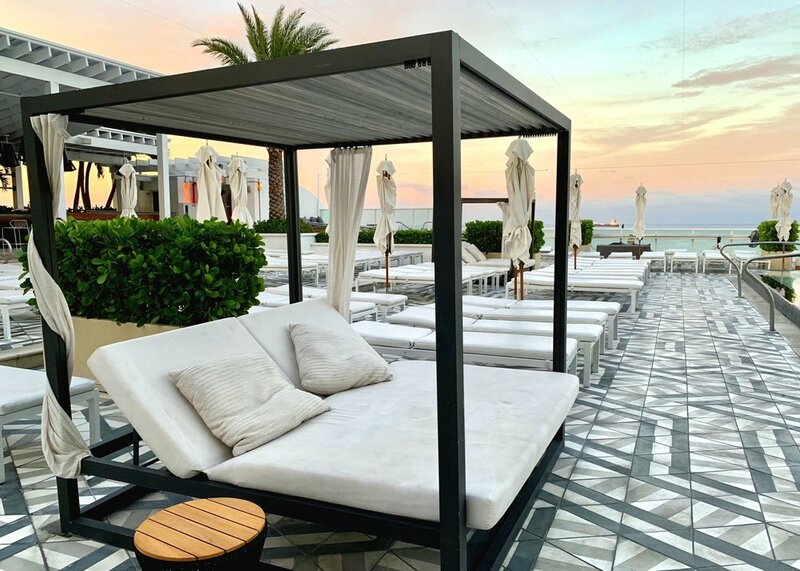 We really enjoyed this funky hotel and although it isn’t the cheapest hotel in Fort Lauderdale, if you fancy treating yourself to a little luxurious mini break before a cruise then its as good as it gets. If you would like to read more about the rest of our vacation then visit our Silver Spirit Caribbean cruise review.